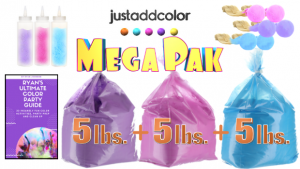 Just Add Color Review by Annette Yen | This stuff is fabulous! Now that we did our multi-generational Thanksgiving with the kit, my 20-something kids and their friends are dreaming up all kinds of ways to have an at-home powder fun event. Watch my blog for more to come!